A mink escaping in an Animal Liberation Front style raid in Sweden. Photo from DirectAction.info. 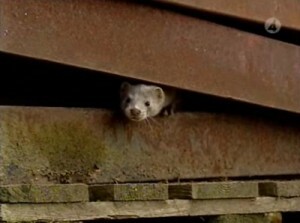 William Viehl, 22, and Alex Hall, 20, were arrested in connection with the August, 2008 release of 300 minks from a South Jordan fur farm. It caused about $10,000 in damages. Spray painted slogans were found on the scene, including “No More Mink, No More Murder” and “ALF: We Are Watching.” The two are also accused of attempting to damage another mink farm a few months later. This is a local soldier out of Utah just letting you guys know of a raid that just happened last night at the South Jordan, Utah McMullen Mink Farm, 300 plus mink were released with all their breeding records destroyed. Good news, haven’t seen this done in a while so it had to be done. Details of both charges are still quite sparse. The Department of Justice press release surprisingly doesn’t mention the AETA, or the word “terrorism,” but the language of the charges are pulled directly from the legislation. The first charge, a felony related to the raid at McMullin mink farm, could mean up to five years in prison and a $250,000 fine. The second charge, a misdemeanor, could mean up to a year in prison. The Utah indictment comes on the heels of the recent Animal Enterprise Terrorism Act charges in California. In that case, the FBI argues that the activists were involved in a campaign of “terror” that including chalking defamatory slogans on the sidewalk, wearing bandanas at a protest, distributing fliers, and attending a protest where an alleged forced entry took place. Unlike what most think of when they hear the word “terrorism,” though, none of it–no crime by the Animal Liberation Front, Earth Liberation Front, or related groups–has ever resulted in the loss of a single human life. Perhaps the most significant difference between Al Qaeda terrorism and “animal enterprise” terrorism, a difference that has been completely ignored by mainstream news articles and government press releases, is that one is intended to destroy life while the other is intended to save it.